At Eagle Pass, we finally hopped the border and discovered that Mexico was not, as we'd been warned on numerous occasions, over-run with thugs and drug lords. Baja California is by far the most popular route for cyclists, but wanting to experience a less-visited part of Mexico, we chose to cycle Mexico's Atlantic Coast and Yucatan Peninsula. After following the Rio Grande past the cities of Nuevo Laredo and Reynosa, we cycled south passing through Tampico, Veracruz, Coatzacoalcoas Villahermosa and Chetumal. Highways were often crowded with double trailer semi's and navigating cities with a million+ in population left us exhausted and longing for some quiet backroads. Biking Belize, with its un-crowded roads and laid-back villages, was a blessing after all the hustle and bustle of Mexico. We skipped the beaches and biked inland through Orange Walk, Rockville and on to San Ignacio before pedaling across yet another border into Guatemala. Cycling Guatemala was tough! In the Highlands, we encountered some of the most grueling climbs of the entire bike expedition. We began our bike trip through Guatemala at the border town of Ciudad Melchor, visited the remote ruins at Yaxha, cycled on to El Remate and followed some rough back roads around Lake Peten Itza to San Andreas, where we picked up a paved road to Sayaxche and continued on through the Highlands to the coffee-growing center of Coban. Our next stop was the small Highland village of Chicaman, before continuing on through the steep mountain roads to Lake Atitlan, where we relaxed at San Pedro. A steep climb out of San Pedro around the back side of the lake and soon we were flying down from the Highlands to the sweltering lowlands of Guatemala. At La Hachadura, we crossed the border into heavily populated El Salvador. We rode through village after village full of friendly locals who were all up for a chat. Roads were mercifully flat until we hit the coast and the hills began again. After a couple of relaxing days at El Sunzal, a surfer's hangout, we pushed on towards La Libertad where the road again flattened out. 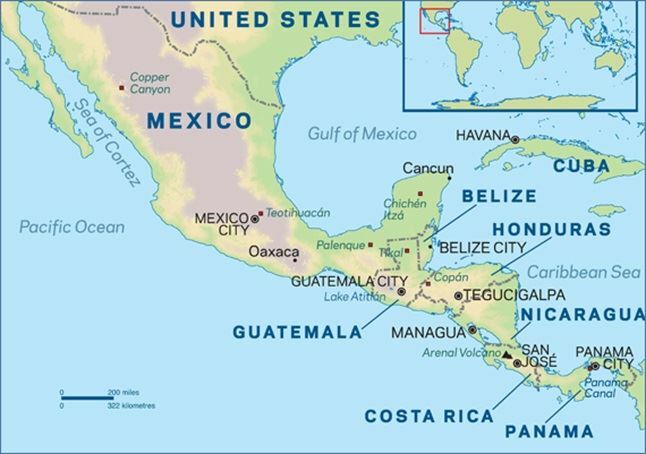 After spending just one night in Honduras, we rolled into Nicaragua, known as one of Central America's safest countries. On perfectly smooth roads (thanks to funding from the EU) we pedaled through cattle country, volcanoes looming in the distance. Our first stop was the colonial city of Leon, known for its numerous churches and vibrant markets. Masaya was our next stop, another friendly city surrounded by beautiful countryside. A short ride away lay Costa Rica, Central America's most visited destination. After crossing the border at Peña Blanca, we relaxed in Liberia for a couple of days. Then it was back to the narrow, busy and dangerous road to the coast. Near Puntaarenas the road vastly improved, and we could take advantage of some nice coastal riding past bustling towns and beach resorts. At Capacho, we left Costa RIca and entered Panama. The Pan-American Highway, varying from hellishly bumpy to perfectly smooth, took us all the way to Panama City: the end of the road for our Central American cycling adventures.